"Owned, operated and maintained by Crabble Corn Mill Trust, the mill was rescued from demolition and opened to the public in 1990. It can now boast to be one of the most complete and working examples of a Georgian watermill in Europe. The current structure was built in 1812 alongside an existing mill which was later demolished to allow for additional storage space - what is now the exhibition area on the ground floor and the tea rooms. However, records show that there has been a mill on this site since at least 1227 when Henry III granted a Charter of Confirmation to St. Radigund's Abbey, the ruins of which can still be seen today on the hill above the village. Six floors of exhibits and milling machinery describe the process of turning wheat into flour, and this wholemeal flour is available for sale at the Mill." Incredible reflections! A five story Mill and perhaps the pump house in front! 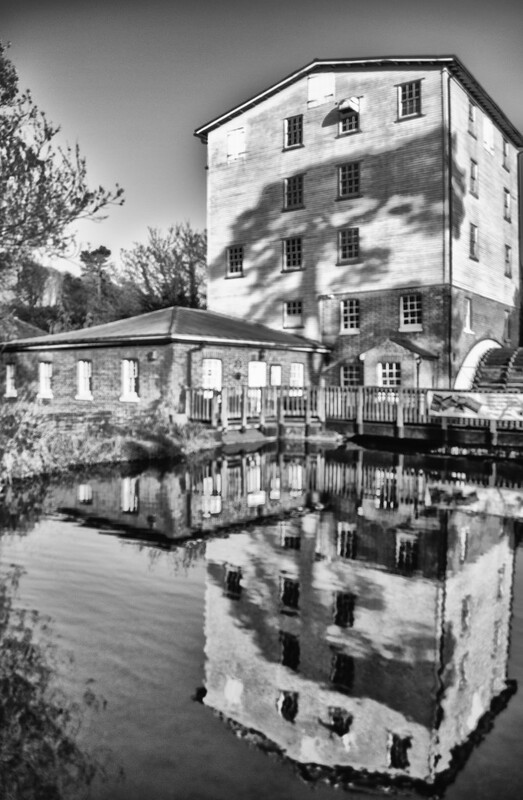 great reflections here - was this a water mill? @peadar Just added a little from the web:) It's situated in Dover and the Camera Club used to meet in the building to the left but they may have moved by now. Hope this helps! Love the reflections and shadows. Oh wow, that is such good news that a marvellous old mill like this has been saved and restored to working order. Really warms my heart. What an excellent piece of history - it must be marvellous to see it work. It's so very large - and looks even more so with your lovely POV and composition. What a great shot. Such a clear reflection, it looks gorgeous on black. Great reflection. Love the composition of your shot. Well done! I love that you chose a black and white edit. It accentuates the shadows on the building and I love the reflections. Fav! Wow, this is a great shot of a wonderful building and reflections! Love the reflections and always great to have the bckground info.